It is mid morning on Johnstone Strait and we came upon a pod of what appeared to be orca resting. I am not sure that I would call this resting as most of the time seemed to have been spent playing. 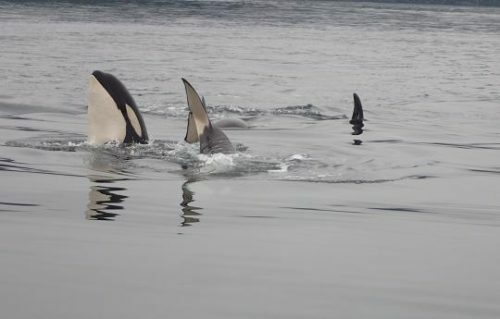 This pod of orca took more than an hour to move a hundred meters (yards). The adults would drift with the current while the young spy hopped, tail slapped and rolled on their backs. Fantastic viewing and I even saved on fuel. There are stellar sea lion in the lodge’s whale watching viewing area all year but they are more abundant in the spring and fall as they pass through on their migration between Alaska and California. We make a point of stopping to watch the sea lions on their “haul out rocks” and at times they make a point of coming to visit our boat. 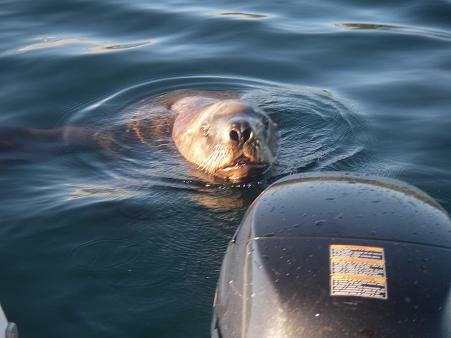 Sea lions like many marine mammals are curious and will approach your boat if you are sitting quietly. However this is a little closer than normal but then it was a calm day on the water and we were near a school of herring.